Pinata Yada Yada is a clear base with differently sized blue,green,silver, pink, red, & gold glitters. There are lot of colors in here I may of even missed on. 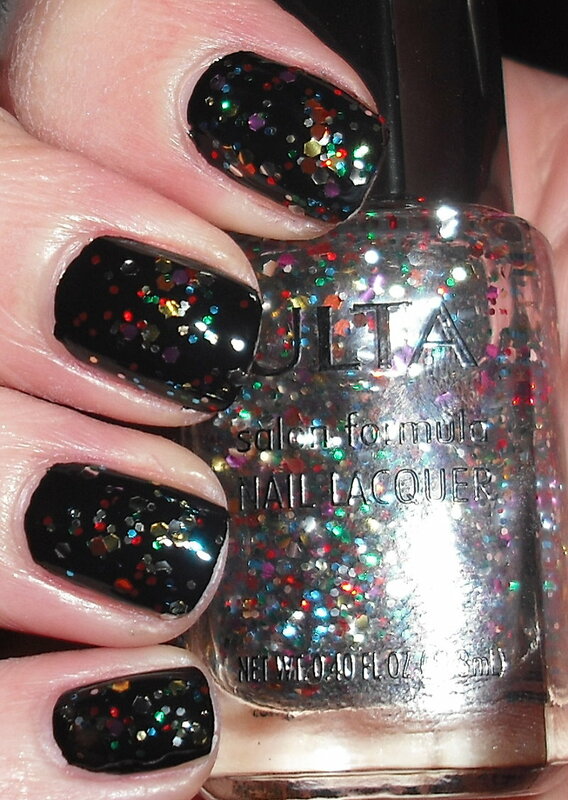 These multi-colored glitter bomb top coats seem to be pretty popular lately. 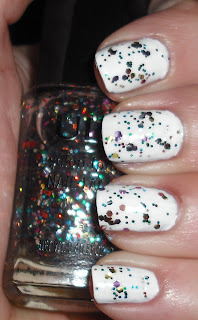 I know this was started by Deborah Lippmann "Happy Birthday". So far I know of Milani Gems, Wet n' Wild Party of 5 Glitters, NYX Carnival, and of course this Ulta one. I love these glitters especially since I don't have to pay $18 for them! A bottle of Pinata Yada Yada is in one of my prize packs for my current giveaway! Over white may be perfect for Easter! Thanks! oO, I have this one! Isn't it pretty? It's great for layering over screamin' colors. I hate to drag the husband into Ulta or Sephora so I try to trips by myself. I can sneak into Ulta under the guise of "I'm stocking up at Trader Joe's." HAHAHAHHA! I really like this over white!! My boyfriend is the opposite, he is the one choosing the colors and let me know its pretty. i think i got him into nail polish world. Pretty! I'm definitely not minding all these Happy Birthday dupes.. I use it so much, it's nice to have a cheap alternative! My poor boy always stands there looking bored to death while I fret over what polishes to pick. I think he's secretly amused at my indecisiveness, though! You got your BF to go into Ulta with you? hee hee He's sweet! haha our boyfriends sound the same! I know that groan you are taking about haha. I don't know if this would work for yours but I always offer to drop my husband off at Barnes & Noble (at the other end of the shopping center) and come back for him when I'm done at Ulta. I love the way glitters like this look on other people but I can't seem to wear the really glitter-heavy ones. I snatched up Party of 5 Glitters and ended up giving it away almost immediately. I have a terrible habit of peeling them off.